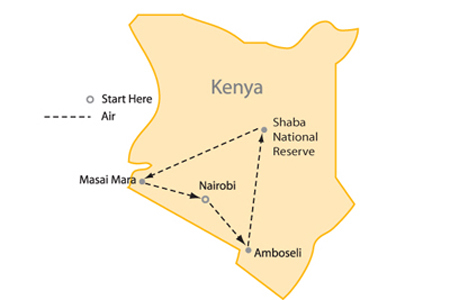 Arrive to Nairobi, Kenya, where you are met and escorted to your hotel, located in the serene wooded suburb of Karen. Spend the remainder of the day at leisure. Time permitting, enjoy an optional visit to the Karen Blixen Museum and Giraffe Manor for a view of the rare Rothschild giraffe (additional cost). Morning fly to Loisaba Conservancy, featuring stunning views across Laikipia Plains to Mt. Kenya. 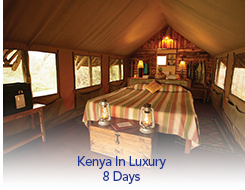 The Loisaba Tented Camp’s spacious and airy tents can be left open to the elements to catch the gentle breezes. High ceilings, polished wooden floors and contemporary African styling provide a sumptuous setting when not exploring Loisaba.